On Feb 15, Prime Minister Hwang Kyo-ahn convened the National Security Committee (NSC) to discuss the incident. He labeled the assassination an “inhumane criminal act” and a “terrorist act.”13 Foreign Minister Yun Byung-se suggested that North Korea may have violated Malaysia’s sovereignty.14 Lim Sung-nam, 1st Vice Minister of Foreign Affairs, announced that Korea and the U.S. will continue to discuss the possibility of reinstating North Korea as a state sponsor of terrorism.15 A bill has already been introduced in the US House of Representatives calling for such a move. The Constitutional Court (CC) announced the final deposition date as Feb 27.19 This would allow the CC approximately two weeks to formulate and issue its opinion. Park’s team has been trying to push the ruling date past Mar 13, but the CC appears determined to make the final decision before that date. Preparations for the upcoming presidential election are underway. The Constitutional Court (CC) is expected to make a ruling on President Park’s impeachment by Mar 10. If the CC upholds the National Assembly’s impeachment decision, the presidential election must take place within 60 days. The date must also be announced 50 days prior to the election, which means that election may take place sometime between Apr 29 and May 9. Election usually takes place on a Wednesday but given the number of national holidays during the first week of May, there is a possibility that it may be held on May 9. If the government decides that Wednesday is still the best day to hold the election, the date may even be pulled up to Apr 26. A number of individuals have announced their candidacy even though only a handful are considered serious contenders. 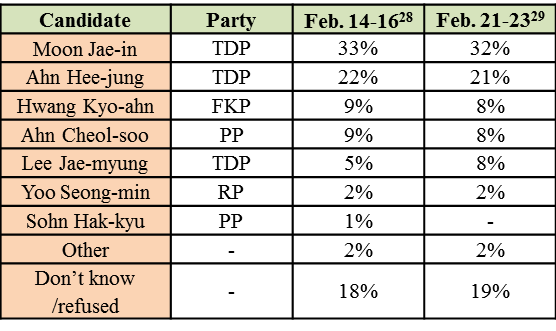 According to recent public polls, Moon Jae-in (33%) and Ahn Hee-jung (22%), from the Together Democratic Party (TDP) lead the pack. Four of the top five candidates are from major opposition parties. Prime Minister and acting-president Hwang Kyo-ahn is the lone contender from the conservative side, although he has yet to make an announcement. Many observers speculate that Prime Minister Hwang’s number will drop if the CC decides to remove President Park from power. “北 김정남, 말레이시아에서 피살,” 조선일보, 2017년 2월 14일. “말레이 경찰 ‘김정남 주검서 신경성 독가스 VX 검출’,” 한겨레, 2017년 2월 24일. “여성 2명, 무인 발권기 앞 김정남 습격 후 도주… 金, 도움 요청한 뒤 쓰러져… 병원 이송중 사망,” 조선일보, 2017년 2월 16일. “김정남 살해 용의자 여성 2명 모두 체포,” 경향신문, 2017년 2월 16일. “김정남 암살 일당 6명…’LOL 여성’은 체포,” 조선일보, 2017년 2월 16일. “여성 용의자, ‘공항서 만난 남성들이 승객들에게 장난치자고 제의’,” 중앙일보, 2017년 2월 16일. “김정남 피살, 숨가빴던 열흘의 재구성,” 한겨레, 2017년 2월 22일. “’김정남 암살’ 용의자 17일 평양 도착, 아랍에미리트-두바이-러시아 경유 평양행…96시간 동안 우회 예상,” 조선일보, 2017년 2월 20일. “말레이시아 경찰 ‘북한 여권 소지 남성 체포’··김정남 피살 네번째 용의자 ‘70년생 리정철’,” 경향신문, 2017년 2월 18일. “말레이시아 경찰, 김정남 암살 연루 추정되는 현지인 남성 체포,” 조선일보, 2017년 2월 24일. “현재까지 확인된 피살 용의자는 10명…북한 국적은 5+α명,” 중앙일보, 2017년 2월 19일. “북 대사관 직원, 김정남 살해 용의자 4명 평양행 도왔다,” 한겨레, 2017년 2월 23일. “황교안 ‘김정남 피살 사건, 반인륜적 범죄행위이자 테러행위’,” 경향신문, 2017년 2월 20일. “김정남 암살은 말레이시아 주권 침해이자 국가주도 테러,” 중앙일보, 2017년 2월 23일. “‘김정남 암살, 北정권 잔혹성 드러내’… 테러지원국 재지정 급물살,” 동아일보, 2017년 2월 24일. “北대사 ‘김정남은 자연사…말레이, 한국과 결탁해 북한 배후로 몰아’ 황당 주장,” 조선일보, 2017년 2월 20일. “‘김정남 사건이 미국이 한국과 공조해 사드를 밀어붙이려는 시도로 보인다’는 북한 대사,” 중앙일보, 2017년 2월 20일. “탄핵심판 최종변론은 27일… 헌재 3월 13일前 선고할 듯,” 조선일보, 2017년 2월 23일. “[박근혜 탄핵심판]박 대통령 탄핵 선고 전 하야설 떠돌아,” 경향신문, 2017년 2월 22일. “카운트다운 탄핵심판, 朴대통령 출석·선고일 ‘최대 변수’,” 서울신문, 2017년 2월 23일. “특검 ‘대통령 기소중지’ 카드로 황교안 대행 압박,” 중앙일보, 2017년 2월 24일. “종료 임박 특검, 삼성 수사 ‘D-5’…이재용 보강조사 총력,” 연합뉴스, 2017년 2월 23일. “이재용 구속… 뇌물죄 한발 더간 특검, 朴대통령 탄핵심판에도 영향 미칠 듯,” 동아일보, 2017년 2월 18일; “무산된 수사기간 연장…특검팀 ‘마지막날까지 수사’,” 한겨레, 2017년 2월 23일. “’특검 연장’ 오늘 국회 처리 무산…공은 黃 권한대행에,” 조선일보, 2017년 2월 23일. “‘특검 연장법’ 사실상 무산,” 서울신문, 2017년 2월 24일. “[단독] 檢 ‘특검 연장 안돼도 특수본 주축 더 강하게 수사’,” 한국일보, 2017년 2월 4일. Gallup Korea, date: Feb. 14-16; sample size 1,003; margin of error: +3.1 at the 95% confidence level. Gallup Korea, date: Feb. 21-23; sample size 1,006; margin of error: +3.1 at the 95% confidence level. “민주당, 15일부터 대선 후보 경선 선거인단 모집…일반 국민도 참여 가능,” 중앙일보, 2017년 2월 13일. “한국당, 내일 대선준비위 발족… 국민의당, 3월 13일前 룰 마련… 바른정당, 내달 24일 후보확정,” 조선일보, 2017년 2월 15일. “자유한국당, 선거 40일 전 대선 후보 결정,” 중앙일보, 2017년 2월 15일.